Blue Water: We can live without oil, we cannot live without freshwater. The system of Empire uses many means to brainwash humanity that there is not enough resources for everyone's need. In fact, the Earth not over-populated and freshwater are over-abundance and ready to be used to maximize life duplication. 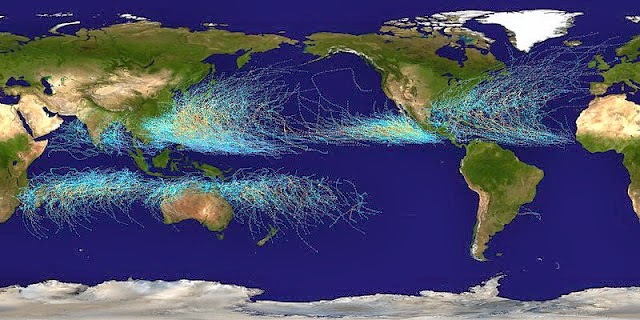 Map of the cumulative tracks of all tropical cyclones during the 1959–2005 time period. The Pacific Ocean west of the International Date Line sees more tropical cyclones than any other basin, while there is almost no activity in the Atlantic Ocean south of the Equator. Desert locations: Central China to Central Eurasia, continue via South Asia passing by South West Asia and end at North Africa and East Africa. Desert in Other continents are Central Australia and West Coast of South America. By looking at the USA and the Atlantic, you know why the East coast is more fortunate in freshwater, or more burdens, than the West coast because of Hurricanes and other weather patterns and water projects developments from the Franklin D. Roosevelt to John F. Kennedy era, now the TVA and others are entering the end of life stage together with many mega-structures and infrastructures. As we follow alternative medias for news without lies, we understand very clearly what is been meticulously crafted to cheaply demolish these infrastructures for reconstruction the same way they did in WW1 and 2, now through economic crisis, police states, dictatorial power and WW3 using thermonuclear amongst their many options. The Pacific Ocean west of the International Date Line, South of China which is Southeast Asia sees more and stronger tropical cyclones than any other basin. Laos has no destructive power of Typhoons like the Philippines and there is neither the destructive tornado nor Hurricanes like the US. The development of Indochina is far behind other nations such as Japan, South Korea, Taiwan, Malaysia, Singapore and Hong Kong. China is in early developing phase. 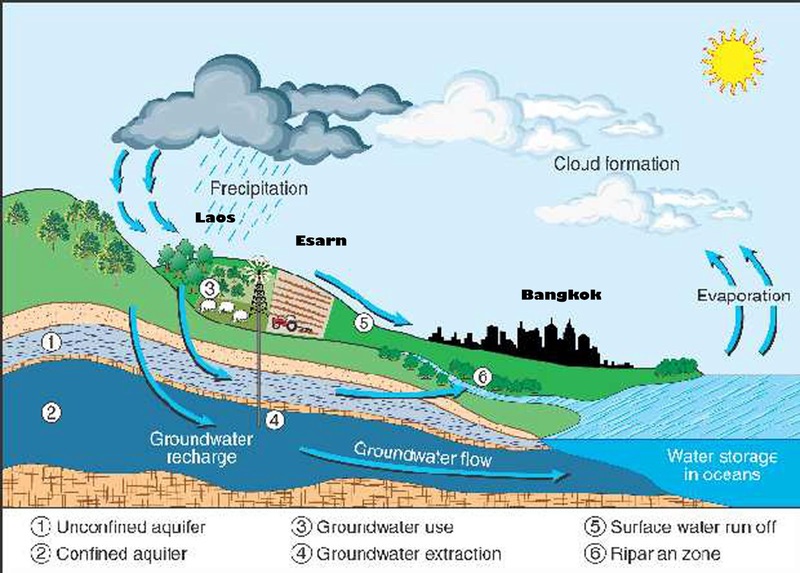 Monsoon rain precipitations and the freshwater cycle: between Burma, South China, Vietnam, Laos and Thailand, additional Freshwater are supplied all year round which is the only continental region on earth that has major monsoons in addition to already most active Tropical Cyclones. As water is very important commodity, we cannot live without it for 24 hours. We can live without oil for many days. Petrol is an option not a necessity. 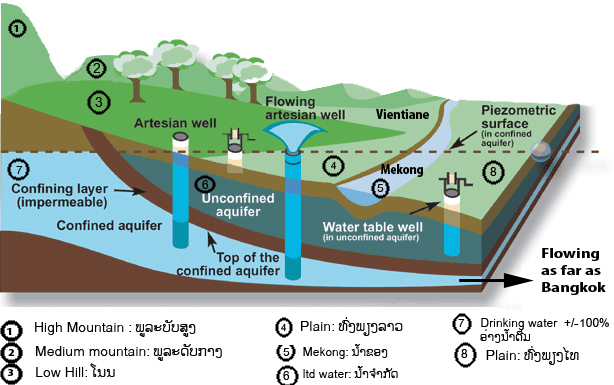 In fact, the competition in water supply is the source of international conflicts that the “British Empire” is proudly sponsoring such as the Mekong River Commission and many NGOs for human depopulation agenda. Do not scale. What is untapped is actually under the ground, deep in the earth crust, freshwater, minerals, rare earths, fission and fusion energy that is where we are going as well as rising to use minimum surface footprint and to maximize energy flux density per person and per square kilometer in major big cities and by keeping the biosphere and higher for farming in other areas. In England, chalk filters the water to a very high standard, in Laos, terra cotta acts as filters, the reddish color of the Mekong, in South of Thailand, the filter is clay, once this filtering effect has taken place the water is collected in the aquifer. By drilling into this resource for extraction, freshwater can be consumed immediately without any refinement. Why is Ground Water so clean? Three reasons that life needs; light, oxygen and warmth. Under ground, there's no light, very little oxygen and the temperature is around 6 degrees, so bacteria have little change to duplicate, most viruses are harmless but useful except the ones harvested by the “British Empire” for the purpose of population reduction. How deep would the bore hole need to be? As the Water enters the surface, it then starts a very long slow journey through to the Aquifer. This can take centuries to reach the lower depths. We bore a hole into the top of the resource and then drill lower into the central areas. This ensures that the water extracted would be at least 20 years since it left the surface and started its filtration journey. Forty to eighty meters is the general depth which is bored. A Bore Hole will give you cool pure water forever. You and your family will be consuming water that is of a higher standard than tap water. A Bore Hole puts you in control of the water you want. No chlorines or fluoride. You won't even buy bottled water again. Freshwater is probably one of today’s most precious resources and vital for every lower form of everyday life. Besides the obvious Freshwater usage for drinking, washing and cooking, even more freshwater is needed for material developments we are consuming and services we are using. In some developing country such as North Africa, Russia and China, freshwater demand will exceed supply by 50%. Freshwater plays an important role in the world economy, as it functions as a solvent for a wide variety of chemical substances and facilitates industrial cooling and transportation. Approximately 70% of freshwater is consumed by agriculture allowing organic compounds to react in ways that ultimately allow replication, feeding viruses and every photosynthetic organism needs fresh and sea water to produce energy and generate oxygen by consuming CO2. All known lower forms of life depend on water. It takes around 3 000 liters of water, converted from liquid to vapor, to produce enough food and materials to satisfy one person’s daily dietary need. 10 billion inhabitants will need 30 trillion liters daily. There is increasing competition worldwide for water from industry, urbanization and biofuel crops. The secret of economy rely not on the things produced but rather on the order and moment which is consumed or transformed to new state. As water is very important commodity, we cannot live without it for 24 hours. We can live without oil for many days. Petrol is an option not a necessity to maintain lower form of life. In fact, the competition in water supply is the source of international conflicts that the “British Empire” is proudly sponsoring such as the Mekong River Commission. The reason for their non-developments is because it is an obstacle to the “British Empire” policy, “the British Royal commission on population” highlighted later in this document. It is essential to recognize that virtual water is cumulative. To produce one kilogram of wheat about 1 000 liters of water are needed, but for beef about 15 times as much is required. For Iraq, the source of water is in Turkey. The source of water for Shanghai is in Tibet. In the US, because of water engineering project in such the Imperial Valley, 90% of water is exported to California, feeding its entire population and land price sky rocketed when the water distribution projects was announced. Every drop of this clean and free energy is used for food production, industry, power generation and transportation. Engineering renewable water and its energy projects was used to lift many countries out of recession, generating jobs, generating goodwill in the long run. The world population distribution is related to the rainfall and precipitations. Monsoons feed one half of the world population from India to South China and South East Asia. Plan had been drown up to build series of dams on the Mekong and make it navigable during Franklin Roosevelt Legacy and repeated during JFK time. Because of the Presence of British and its looting partners such as the French, the Australians and other puppets in the region, such projects are frozen. US will divert water from North to South but China will divert from South to North, but before water can be diverted, the water needs to be stored first. Without it, the water rainfall will run off to the ocean in no time. For the British and its Alliance, the population growth in these states is especially worrisome, since it will quickly increase relatively their political and economic strength. That balance of power was the geopolitical pretext for an official policy for the political and economy oppression of these nations. However the truth of the matter is to spell out nothing more than the British Royal commission on population which King George VI had created in 1944 to consider what measure should be taken in their national interest to influence the future trend on population. Later this agenda becomes live long mission for Prince Philip, who in 1981 said: “Human population growth is probably the single most serious long-term threat to survival. We are in for a major disaster if it isn’t curbed. The more people they are, the more resources they’ll consume, the more pollution they’ll create, the more fighting they will do. We have no option. If it isn’t controlled voluntarily, it will be controlled involuntary by an increase in disease, starvation and war”. As a result of this policy largely run out of their Jesuits IMF, World Bank, Free Trade and Environmentalist lies conditionality, many nations, once was food self-sufficient nations, have been forced into food import dependency for the past 40 years that include Laos, the country that have more Freshwater in the world, per capita, still clean, limitless and only exploited just to produce a fraction of electricity. Now neither food stock or infrastructure or appropriate financing exist for their food supply. "Bad times, you may say, are exceptional, and can be dealt with by exceptional methods. This has been more or less true during the honeymoon period of industrialism, but it will not remain true unless the increase of population can be enormously diminished. At present the population of the world is increasing at about 58,000 per diem. War, so far, has had no very great effect on this increase, which continued through each of the world wars. . . . War . . . has hitherto been disappointing in this respect . . . but perhaps bacteriological war may prove more effective. If a Black Death could spread throughout the world once in every generation, survivors could procreate freely without making the world too full. . . . The state of affairs might be somewhat unpleasant, but what of it? Really high-minded people are indifferent to happiness, especially other people." “Human population growth is probably the single most serious long-term threat to survival. We are in for a major disaster if it isn’t curbed. The more people they are, the more resources they’ll consume, the more pollution they’ll create, the more fighting they will do. We have no option. If it isn’t controlled voluntarily, it will be controlled involuntary by an increase in disease, starvation and war”. As a result of this policy largely run out of IMF, World Bank, Free Trade and Environmentalist lies conditionality, many nations, once was food self-sufficient nations, have been forced into food import dependency for the past 40 years. Abraham Lincoln said this: “The world has never had the good definition of the word "liberty". We all declared for liberty, but in using the same word, we do not all mean the same thing. With some, the word liberty may mean for each mankind to do what they pleased for themselves and the product of their labor. While with others, the same word may mean for some mankind to do as they pleased with other mankind and the products of other mankind’s labor.” Here are two not only different but incomparable things, called by the same name "Liberty" and is follow that each of the things exists by respective parties called by two different and incompatible names; liberty and tyranny." Tyranny is the Corporate Empire. Since 2010, our water have been contaminated by chemicals that seem to be at first glance, “accidents”. But what if they were not accidents but planned to make it appear that way? What are the chances of all of these chemical accidents happening one after the other for the past 4 years but before that, there were never any problems. One can only assume that since there is no accountability in our government, the corporate elite can have as many “accidents” as they so desire without impunity. In 2010, a BP oil rig blew up and spilled an enormous amount of oil into the Gulf of Mexico. Weeks later, the beaches all along the Gulf coast were filled with tar and dead fish and birds. After stopping the spill, BP used a chemical to dissolve the oil from the water supply. However, rumor has it from some of my friends who have family in the military, that the chemical didn’t dissolve it, but merely suppressed it below the surface of the water and is now stuck at the bottom of the Gulf of Mexico. If that’s the case, what will happen when that chemical deteriorates? Will the oil resurface? Of course, you won’t find or hear anything else on it in the mainstream media until it actually happens. One thing’s for sure is that people along the Gulf Coast are feeling the effects of the toxic chemicals and already have breathing problems, while dead fish and tar continues to brush up on the beaches. Following the BP oil spill, in 2011, an earthquake and tsunami mysteriously happened to destroy much of the Fukushima power plant in Japan. Some like Jim Stone, former NSA analyst stated in 2012 (whether it’s been debunked yet or not, I don’t know) that the plant was sabotaged and that there was no real tsunami or earthquake but merely a mini-nuke that exploded inside the reactors in order to punish Japan for not going along with the Zionists plans. In any case, since then, radiation has been pouring out and contaminating the entire Pacific Ocean and West Coast of the U.S. Fish have wound up with blood coming out their eyes, animals and humans alike along Alaska have been reported to showingsymptoms of loss of fur or hair. In addition to that, the beaches of California have recorded dangerously high radiation levels and the debris from Fukushima being washed up on shore, only worsens the situation. Furthermore, Hawaii has become radioactive and the waters around it are most likely all contaminated, despite no warnings from the mainstream media or our government. Next, in late 2012, we have the Louisiana Sinkhole in Assumption Parish that seems to be only growing in size with each passing day and no one, not even the mainstream media is acknowledging it, let alone doing anything about it. People are forced to relocate from their homes and county officials still have no clue as to how to tackle the problem. Just recently, in December 2013, North Dakota had an oil spill that ended up reaching as far as the Missouri River poisoning some of the water there. Even more recently, we have the chemical spill in Charleston, WV where it may be expanding into the Mississippi River and the spill is so bad that people cannot use the water to shower, let alone drink nor can water filter companies confirm if their filtration systems actually work on filtering out that chemical. Water is being grabbed off the shelves like there’s no tomorrow, leaving many stores empty while FEMA shows up to try and resolve the crisis (and since Hurricane Katrina, we all know how long it will take them to deliver water). Just today, we find a radiation plume in the waters of the Savannah River in South Carolina and now no one is drinking the water there, either. It seems everywhere you turn, another “chemical accident” is happening. What are thechances? I say, one’s an instance, two’s a coincidence, three’s a pattern and four’s a conspiracy. So let’s sum up, the elite have decimated the Pacific waters with the Fukushima contamination and radiation. They have destroyed the Gulf of Mexico with the BP oil spill. They have polluted part of the Missouri river in North Dakota with another oil spill and are now attempting to poison the waters of West Virginia and the Mississippi River. Finally, they have tainted some of the water in the Savannah River in South Carolina. It almost looks as though they are trying to contaminate our water supply by making things appear as “accidents”. It seems the next logical step, if they are going after the big rivers, would either be the Colorado River or the Red River (bordering Texas and Oklahoma), as those seem to be the next set of major rivers in the country. Since there have been a lot of fracking and minor earthquakes in both Northern Texas and Oklahoma, I can only imagine if the Red River is next. However, the corporate elite may decide to kick it up a notch and have an “accident” along the East coast, namely the Atlantic Ocean (if the BP oil spill didn't destroy much of it already) or more likely the Great Lakes. Also, in recent news, it is being reported that water from the Great Lakes is being sent to China. Which may be the reason why they haven’t had a “chemical accident” there yet, but with the way things are going, those are the only bodies of water left that haven’t been contaminated. So would they be crazy enough to pollute the Great Lakes? Well, if they were, people may want to be on the lookout for any “accidents” to possibly occur near the St. Lawrence River or the Gulf of St. Lawrence where it can easily spread into the Great Lakes. Also the rivers along Quebec and Montreal may be susceptible as well. One thing’s for sure, if all our water becomes infected, you can expect the UN, FEMA and the corporate elite to be the only ones who will have what’s left of the clean water supply. So after studying these incidents, you had better have your own supply of water stored away because if you think they will come to your rescue and shower you with their reserves, then you are in for a rude awakening. Air pollution in the Chinese capital reached new, choking heights on this month. 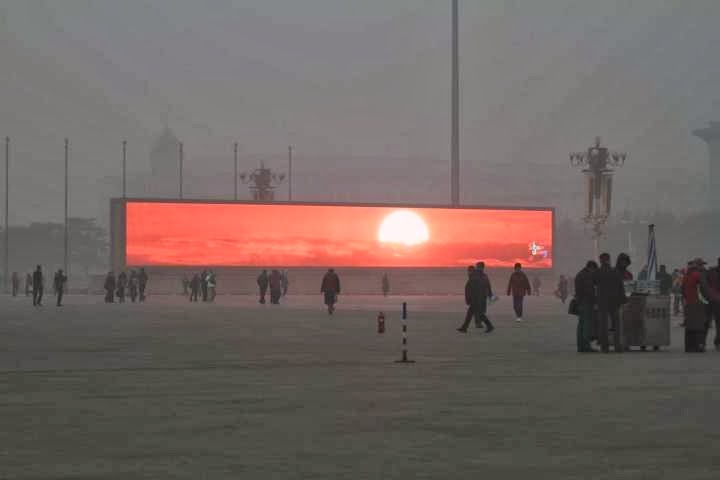 Those who still felt the urge to catch a glimpse of sunlight were able to gather around the city’s gigantic LED screens, where this glorious sunrise was broadcast as part of a tourism ad.